CIVIL RIGHTS “1964-2014” 5O YEARS 2-coin set includes: coin of President Kennedy addresses nation on Civil Rights – June 11, 1963 plus coin of Lyndon Johnson signing Civil Right Act – July 2, 1964. The Civil Rights Act of 1964 is a landmark piece of civil rights legislation in the U.S. that outlawed major forms of discrimination against racial, ethnic, national and religious minorities, and women. This 2-coin set of colorized JFK Kennedy Half Dollar U.S. Coins are Genuine Authentic Legal Tender of the United States, which have been enhanced by the Merrick Mint with images marking the 50th Anniversary of Civil Rights Act of 1964. These high-quality genuine Legal Tender United States coins have been colorized using a unique painstaking multicolor authentic process. Colorizing coins involves the unique application of special inks directly to the surface of a coin that achieves a level of detail, color saturation, and durability that is #1 in the industry. The result is an everlasting colorized coin collectible of ultra-high quality. 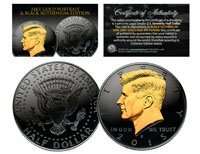 The 2-coin set comes with a certificate of authenticity with each coin coming in a premium coin capsule.